Child Soldiers—Where Is the Help? This post originally appeared on The Daily Beast. The film "Machine Gun Preacher" illuminates the horrifying problem of child soldiers in Africa, but if the U.S. and other nations do not seize the moment to help, a vital opportunity will be lost. For nearly 25 years, the Lord’s Resistance Army, or LRA—a brutal rebel group in Central Africa notorious for using child soldiers and mutilating its victims—has been largely ignored by the international community. The movie "Machine Gun Preacher" brings attention to one effort to rescue some of these kids who have been press-ganged into military service and forced to commit terrible atrocities. But if there isn’t a larger international effort mounted to stop the leaders of the LRA militia and finally bring an end to the horrors, then all that these child victims will have left to protect them will be the prayers of unarmed preachers. Formed in northern Uganda in 1987, the LRA terrorizes civilians—abducting, killing, mutilating, pillaging, and displacing. It has metastasized and is now kidnapping kids in three other neighboring countries in Central Africa, threatening stability in the new state of South Sudan and the Democratic Republic of Congo. A ray of hope for these at-risk children of Central Africa emerged in May 2010 when Congress passed legislation aimed to end this crisis—the most widely supported Africa-specific legislation in recent congressional history. It was widely supported primarily because it was backed by a growing movement of American youth called Invisible Children working in their high schools and colleges in support of the kids in Central Africa. The bill gave President Obama a mandate to bring an end to Africa’s longest-running insurgency, which he called a “unique crisis of conscience.” As required by the legislation, his administration submitted a strategy last November to eradicate the LRA and help communities affected by the violence rebuild. However, it has been almost one year since the strategy’s release, but the strategy isn’t being implemented effectively and the congressional intent of the legislation is not being fulfilled. 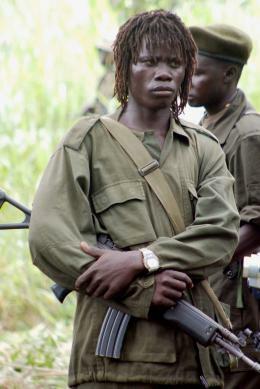 Meanwhile, the LRA gains strength and continues to kidnap kids and terrorize communities. Fortunately, the U.S. now has a unique and critical opportunity regarding the LRA. The African Union, or A.U., is authorizing a wider African-led mission against the group. In the A.U., the U.S. would have a multilateral partner for providing a surge of diplomatic, military, and intelligence support to bring a long overdue end to this crisis—in line with congressional intent. But without such a surge and the involvement of European and new African partners, the A.U. mission would simply put a new hat on the current faltering efforts. To ensure that the new mission is successful, the Obama administration must take three key steps—bringing to bear the diplomatic, military, and intelligence assets envisioned within its LRA strategy. First, the new mission needs capable and willing forces. The critical missing ingredient now to eliminate the LRA once and for all is robust military operations to apprehend the group’s leader, Joseph Kony, and his senior commanders, in conjunction with efforts to protect civilians and encourage combatants–mostly child soldiers–to defect. Rethinking apprehension and protection operations will require new capabilities and highly trained forces, including special forces from other African countries like South Africa, Ethiopia, and Kenya to support the Ugandan troops already deployed. President Obama should reach out directly to African presidents to help recruit the necessary special forces, and redouble support for Uganda and the other armies already in the fight. Second, the Obama administration–backed by congressional leaders who championed the LRA bill–should provide a surge of military, intelligence, and logistical support to a revamped mission. In particular, it should expedite the deployment of embedded U.S. military advisers, establish a Rewards for Justice program for information leading to the arrest of the LRA senior leadership, and lead intelligence efforts in support of apprehension. Third, the U.S. will need to ensure that civilian protection is also a priority even as efforts to apprehend the LRA leadership intensify. Ensuring that the LRA is not able to abduct civilians, securing more defections, and better utilizing the information former combatants provide about the LRA’s activity and leadership will create openings to apprehend the senior leaders and severely weaken the organization. Capable special forces from other African countries should take the lead on threat-specific civilian protection where the LRA is operating and be in place to apprehend leaders, prevent reprisal attacks, and free abductees after attacks. If no changes are made and the U.S. misses this opportunity, the status quo will condemn thousands more kids to the horrors of abduction and child soldierhood. With the emerging A.U. mission, President Obama has a clear moment of opportunity to finally end the LRA and fulfill the intent of the legislation and over a million young American activists who want to see a real change. In Hollywood, and even occasionally in real life, a preacher with a machine gun can save a few kids. But to stop a marauding militia that has kidnapped tens of thousands of kids over decades, a more potent force is required. The U.S. could partner with Africa and Europe to put that force together and ensure a more secure future for the children of Central Africa.